Ask any independent artist, and they’ll tell you a stream of horror stories involving people posting their work online without permission or attribution, people demanding work for free or well below its value, people expecting to hire for skilled commissions in exchange for “exposure.” Exposure doesn’t pay the bills, and neither does re-posting someone’s work without attribution. Even when an artist puts their work onto the internet for free to expose their talents, it’s still incumbent upon people who share it with others to give credit where it’s due. An example of this working can be seen in the recent story about Spanish artist, Esther García López, wherein their work, given proper credit, led to a full-time job offer. As an author, I both share pieces of my work online for free, and hire other freelance professionals to make my work shine. When I’m surrounded by highly skilled, talented people, I want to see them succeed in their fields, as much as I want to succeed in mine. It has bothered me for years how difficult it is to find out information about the artists and editors of books that I enjoy. Cover artists usually have a tiny credit on the copyright page–a name without contact information–and editors can sometimes be a name amidst the acknowledgements. As I grow more accustomed to designing and publishing my books, I’ve worked to establish a representation of the people who add to their creation in a way that reflects my ethical standards. Throughout the year, as I’ve published five books (four of the under my legal name), I’ve kept the tradition of cover artist in the copyright and editor in acknowledgements, but I’ve also shared their professional bios on the about page at the back, traditionally reserved for the author(s) alone. Why? Because they’re part of the team that made the book possible. Here’s the team for The Grasp of Time! Even in Aranya, where I drew and painted the cover myself, I created a list of attribution for all of the public domain works featured in the book. They might be the work of people long dead, but where possible, I gave attribution in case someone else wants to learn more about their work. 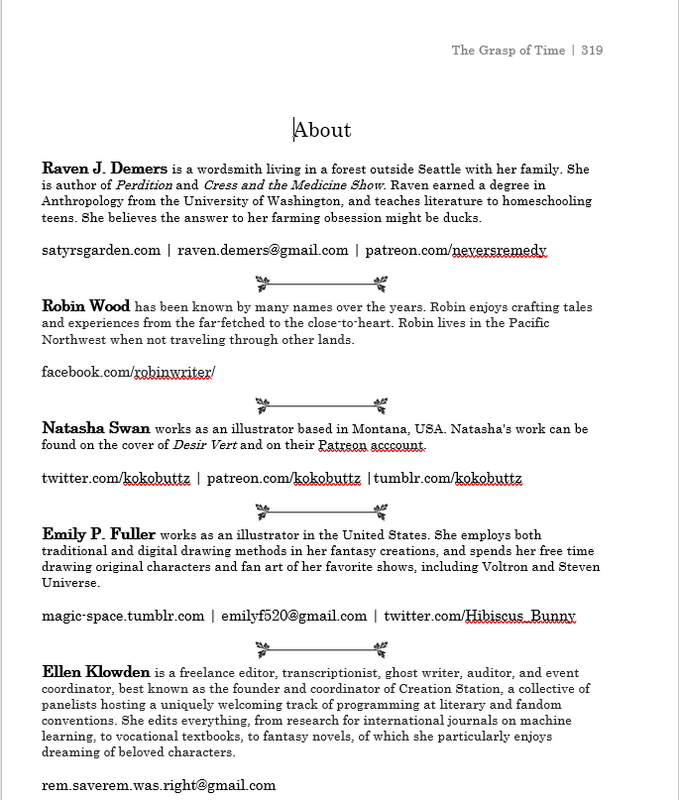 And in The Grasp of Time, my co-author and I share the about page with three other people: Natasha Swan (the cover illustrator), Emily P. Fuller (the illustrator of our coloring pages), and Ellen Klowden (our killer editor). I’m not stating any of this to get a pat on the back, but to encourage other writers to consider how they want to promote the teams that make their novels shine, especially when those teams consist of freelancers who depend on every commission for their livelihood. Attribution matters online, but placing artists in a prominent position within our works makes it easier for those artists to receive the accolades, commissions, and job offers they deserve for their impressive skills. Whether you’re sharing an image you found online*, or publishing a book to share with the world, please take a moment to ensure the person responsible for the art is given proper credit. Oh, and The Grasp of Time has launched. Sort of. It’s going to take a few days for all the sites to sort themselves, but it’s already available on Kindle and in the CreateSpace store. I’m still working on verifying my credentials on Nook Press, so expect a few announcements across the week. *Not sure who made the piece you want to share? Google reverse image search is your friend. You can even do it from your phone.